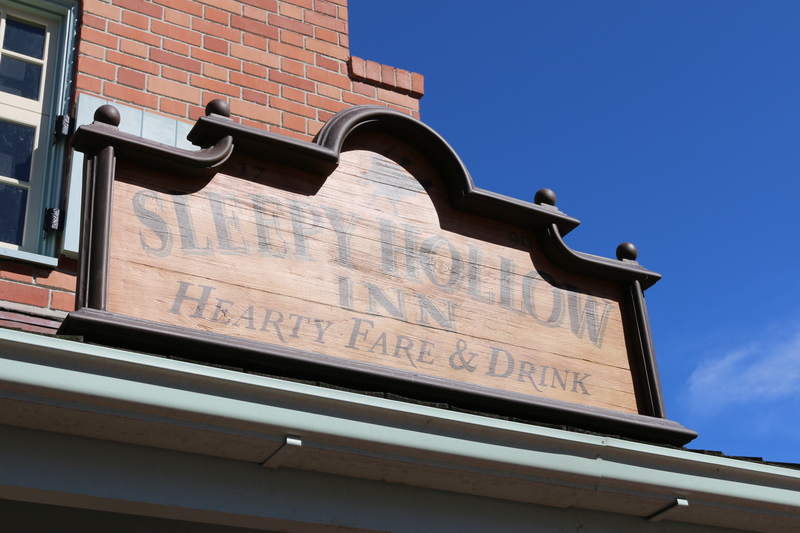 Nestled in a small corner right near Cinderella Castle lies one of my very favorite eateries in all of Disney’s Magic Kingdom: Sleepy Hollow Inn. 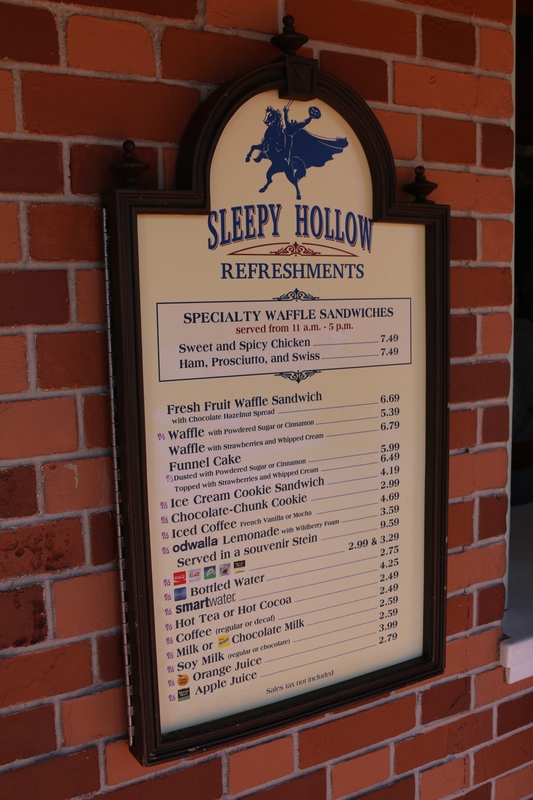 Sleepy Hollow Inn serves funnel cake, ice cream cookie sandwiches, a variety of drinks and most importantly, waffle sandwiches. Sleepy Hollow offers 3 varieties of waffle sandwich. In the morning and evening hours you can get a Nutella (hazelnut spread, for those not familiar!) and fresh fruit waffle sandwich. During lunch time you can also get a spicy chicken waffle sandwich and a ham, prosciutto and swiss waffle sandwich. During this trip we got the spicy chicken and Nutella sandwiches. Each sandwich was substantial enough that we could call it “lunch”. I had the spicy chicken waffle sandwich that had a sweet and spicy sauce on the chicken, plus some slaw and the waffle. It was perfect! I ate every bite. Tara tried the Nutella and fresh fruit waffle sandwich which came stuffed full of strawberries, banana and blueberries. This sandwich was also a hit! Another major benefit of eating at Sleepy Hollow is the location. 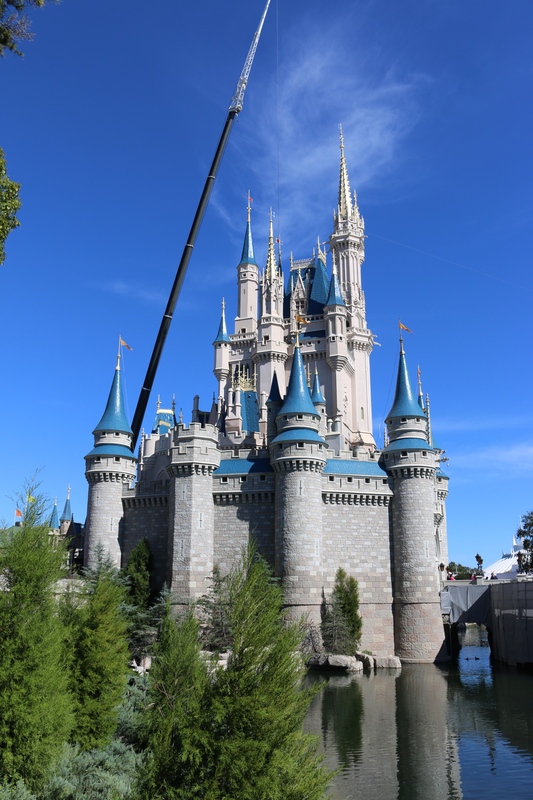 With a view of the castle that is hard to match there are also several tables to sit and enjoy your waffle or funnel cake. In my opinion Sleepy Hollow is a spot not to be missed! This entry was posted in Disney Dining, Disney World and tagged Cinderella Castle, disney lunch, Magic Kingdom, nutella waffle sandwich, sleepy hollow, spicy waffle sandwich, waffle sandwich by Jamie. Bookmark the permalink.